In today's research and application laboratories, it is often necessary to conduct experiments or take measurements in a vibration-free environment. However, largely uncontrollable sources of vibration such as air conditioners, heat pumps, and road and rail transportation systems are just a few mechanisms that contribute to an unavoidable vibrational background noise that is coupled to the foundations and floors of surrounding buildings. Optical systems comprised from multiple components that must be individually mounted and aligned in a precise and rigid fashion are particularly vulnerable to vibration-induced performance degradation. Many types of experiments are impossible or severely hampered by small vibrations. For example, many laser applications require a beam waist of a few microns; if the position of this spot is critical to system performance (e.g., using an ion laser to pump a jet stream dye laser), then vibrations with amplitudes in the micron range can inevitably cause experimental failure. Since visible light has a wavelength of approximately 0.5 micron, interferometry-based experiments (including holography) may also be impossible to perform in the presence of vibrations, even if they are sub-micron in amplitude. Optical and/or mechanical machining or probing of semiconductor wafers requires similar stability. Finally, if an experiment utilizes mechanical elements that move or vibrate, it is often necessary vibrationally to isolate these components from all other critically aligned optical elements. To be useful, the surface on which an optical system is mounted must satisfy several basic requirements. First, it must provide a rigid base on which optics can be mounted and aligned reliably with both long-term stability and no inherent vibrational resonances. It must not only successfully damp any vibrations caused by motorized or moving parts in the experiment, thereby preventing these vibrations from influencing critical optical elements, but also isolate the experiment as a whole from ambient background laboratory vibrations. If these criteria are not met, undesirable effects often result. An individual component, or the system as a whole, may not function properly. Valuable data may be buried in random noise, or data may be totally misunderstood and incorrectly evaluated due to vibrationally induced noise. In the latter case, poor data can lead to frustration, hinder timely progress, and consume resources, which is particularly costly when the system is a laboratory prototype of a production assembly. In an effort to solve these undesirable effects, various designs of optical tables and optical breadboards have been developed such as that shown in Figure 1. Ideally, an optical table should maintain a rigid and flat upper surface without being overly massive. The table is then mounted seismically, usually on air springs, to prevent the coupling of ambient background vibration. In the past, tabletops have been constructed from granite, concrete, wood, steel, and a variety of unusual composite structures in attempts to improve performance, while keeping weight at an acceptable level. Although each of these materials was found to have advantages and disadvantages, the best overall performance was achieved using a composite construction technique. Consequently, a sandwich of clad metal honeycomb is now generally accepted as the best material for optical tabletop and optical breadboard construction. 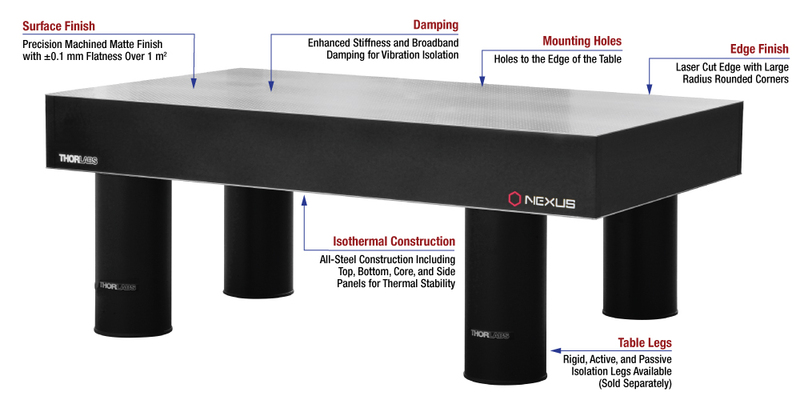 Vibration isolation supports and vibration isolation frames are designed to isolate the optical table and optical breadboard, respectively, from ambient vibrations in the building, which are typically in the 4 to 100 Hz range. Since large frequency differences preclude energy transfer from one form into another, Thorlabs specifically designs its tabletops such that their resonant frequencies are well above 100 Hz; by creating such a large resonant frequency difference, energy coupling cannot occur between the tabletop and its support system. As a result of these efforts, Thorlabs is pleased to offer our Nexus line of optical tables and breadboards. Tables are available in 210 mm or 310 mm thickness, while breadboards are available in 60 mm or 110 mm thick versions. For unique needs, Thorlabs manufacturing facilities can produce custom optical tables such as that shown in Fig. 2. Each tabletop can be paired with several different support structures depending on the level of isolation needed for a given experiment: rigid non-isolating supports, passive air-spring isolators, or active self-leveling isolators. 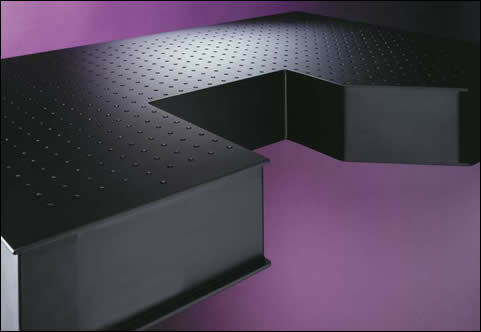 Most commercial isolation mounting systems for optical tables directly damp vertical motion by separating two air reservoirs by an aperture. This will also damp horizontal vibrations but only through the relatively ineffective coupling of the horizontal vibrations to the vertical modes of the dual air reservoir damping mechanism. This results in inefficient second order horizontal damping. Thorlabsâ€™ horizontally enhanced isolators incorporate an integral long pendulum mechanism that has been designed specifically to produce direct horizontal damping. The theory and design of optical tables and isolators is discussed in the following Sections.